Having gobs of horsepower at your disposal is great, but it’s only part of the ride equation. Comfort and handling are equally, if not more, important. With that in mind, let’s introduce you to the 2018 RZR XP Turbo Dynamix Edition. Dynamix is the name given to the company’s revolutionary new suspension system that tunes each individual shock on the fly. How does it work? The system is controlled by a computer that monitors seven key inputs—including steering wheel position, speed and pedal position. These inputs are read at approximately 200 times per second and the computer automatically adjusts each shock to provide the best ride experience at every moment. For example, when cornering, the outside shocks will stiffen up to prevent body roll and keep the vehicle flat. Punch the gas and all four shocks will stiffen up. Brake suddenly and Dynamix will strengthen the front shocks to prevent the vehicle from diving and maximize ground clearance. The system is so smart that it will recognize and adjust to counter steering. There is a seven-inch screen, also known as the Ride Command Dynamix Visualizer, where the driver can see generalized information about suspension tuning. He or she can choose from three ride settings—Comfort, Sport and Firm. Dynamix does the rest. So whether it’s riding trails, racing through the desert or getting airborne in the dunes, this machine is ready to tackle it all. The new Dynamix suspension grabs headlines on this machine, but you’ll also want to know what’s under the hood. 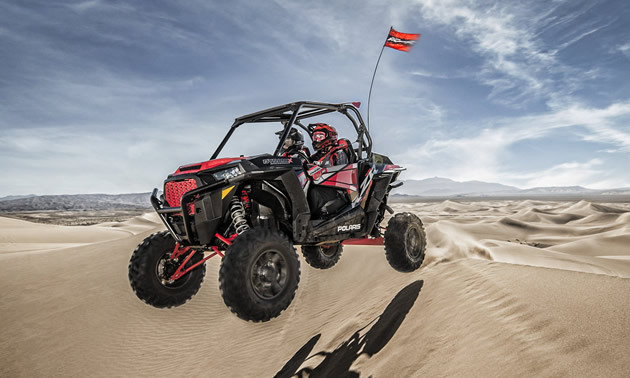 The 2018 RZR XP Turbo Dynamix Edition is powered by a 925-cc ProStar engine with 168 horsepower. The vehicle is 64 inches wide and offers 13.5 inches of ground clearance. So far, the Dynamix Edition is available in a two-seater only.